(Newser) – For a stowaway who made a 10-mile journey squeezed in the wheel well, a koala was lucky to escape with just scratches. The driver of the four-wheel vehicle was unaware of the extra passenger until they arrived at their destination in the outskirts of Adelaide, Australia, and he heard some unusual cries. 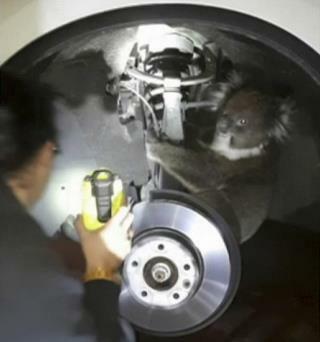 After seeing the koala in the wheel arch, he immediately called animal rescuers, who removed the wheel and eventually extricated the frightened but very lucky animal. "You think you've seen it all. No, I've never seen anything like that and it's absolutely incredible," said Fauna Rescue worker, Jane Brister. The koala suffered superficial injuries and was covered in grease from under the car. "She was crying a little bit, she was a little bit shaken, she was certainly in shock but I rushed her straight to the vet," Brister said. From The Koala Daily Commuter ~ Koala Ride Share program successfully launched! However, it was found that the Koalanaughts need more training to avoid detection. aww! She was crying! :((( I hope they released back to the area where they think she was picked up..